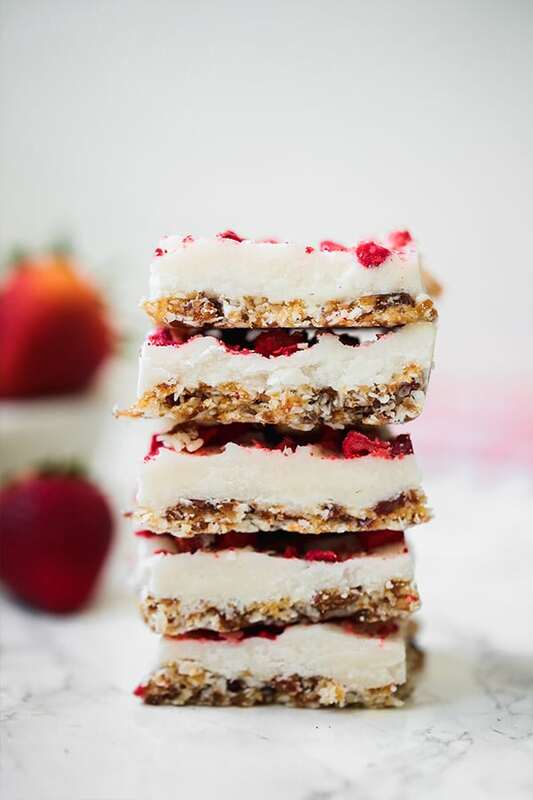 These no-bake strawberry shortcake bars are an easy and delicious treat! They’re paleo, AIP, dairy free, and vegan. Summertime is for ice cream, grilling, and no-bake treats! Anything that keeps the house cool, really. 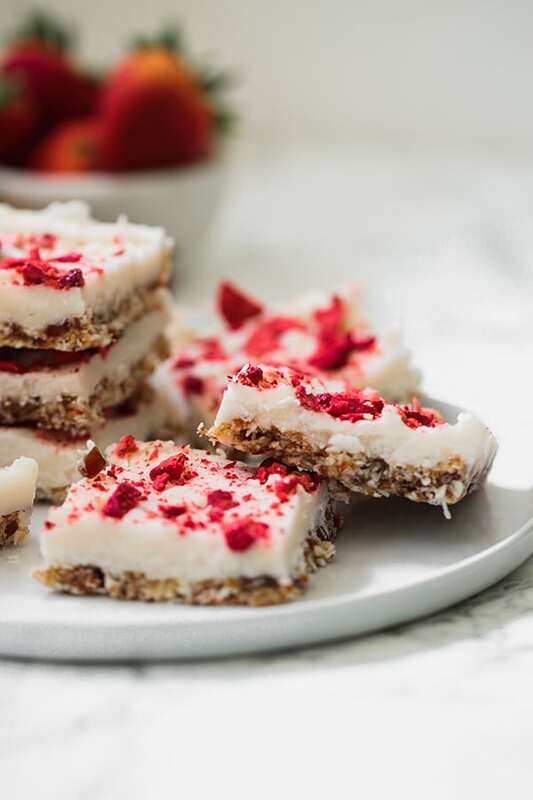 You guys know I love baking, and sometimes I still make exceptions in the summer, but no-bake treats are a must in Dallas, TX. Not only do they keep the kitchen from warming up, but they’re super simple to make, which is always a plus. 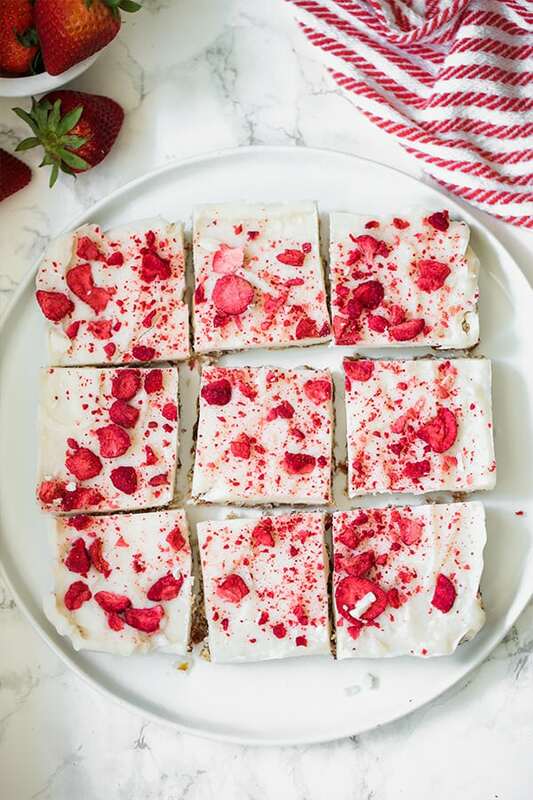 I’m a huge fan of strawberries and cream this time of year, and decided that I’d try a no-bake bar rather than a baked treat! 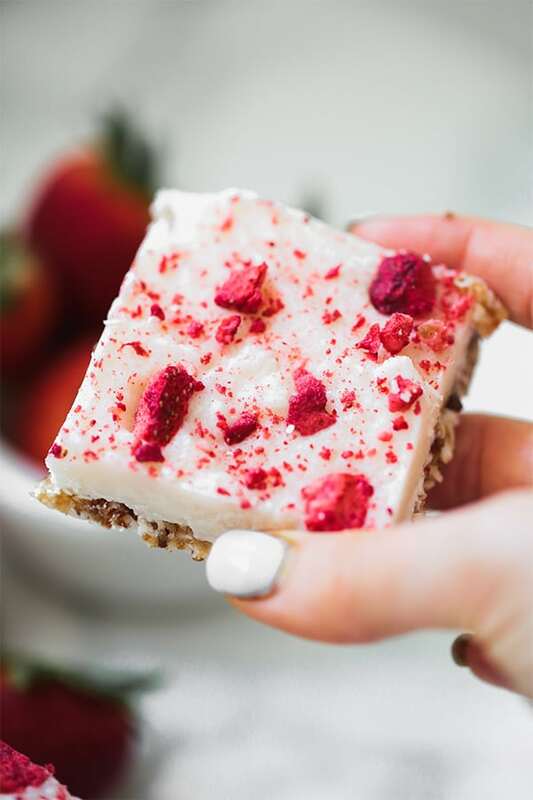 These no-bake strawberry shortcake bars have gotten rave reviews from all who have tried them so far. They’re light and fluffy, not overly sweet, and are made with all real ingredients! This is different from coconut oil. You can find this online or in stores near the nut butter. It’s also called coconut cream concentrate or coconut manna. This makes the filling of the bars lighter and easier to bite into. You can buy coconut cream or you place a can of coconut milk in the fridge overnight and use the cream on top that hardens. This is in both the crust and the filling. You can buy these online or in most health food stores. I never have trouble finding these, and my husband loves to snack on them. These are the main ingredients in the crust. Prepare an 8×8″ inch pan lined with parchment paper. Add the shredded coconut and dates to a food processor and pulse several times until well incorporated. Add in the coconut oil and quickly blend. Spoon out the crust mixture and add it to the pan. Press it down into the pan until it’s evenly flattened. Place the crust in the fridge to chill for 2-3 hours. To make the filling, make a double boiler by filling a medium saucepot halfway with water and bring it to a low boil. place a stainless steel bowl over top the pot to create a double boiler. Spoon the coconut butter into the bowl and stir to allow it to melt. Do not use a microwave to melt the coconut butter, or it will burn. Remove the mixture from heat and allow to cool for 1-2 minutes before stirring in maple syrup and coconut cream. Stir until smooth. Once hardened, remove the pan from the fridge and let it sit on the counter for 5-10 minutes and top with crushed freeze-dried strawberries. Using a sharp kitchen knife, carefully slice into 9 squares some may break a bit, but that’s okay! How much cinnamon goes into the crust? Can’t wait to try this one!! Yum! How much cinnamon in the crust? Hi Katherine! That was actually a typo 🙂 You can do without the cinnamon all together. can I omit maple syrup and dates. I can have neither. I can not have honey either. You may be able to do the filling without maple syrup, but the crust won’t really bind without the dates.